The industry needs a new way. PEO. What is a Professional Employment Organisation? 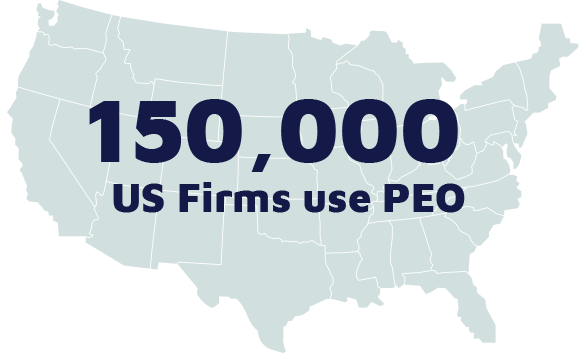 Let’s start with some background, PEO was initially formed in the United States to assist companies deliver healthcare related benefits to their workforce. Due to the buying scale of the PEOs, these employee benefits packages soon quickly expanded. 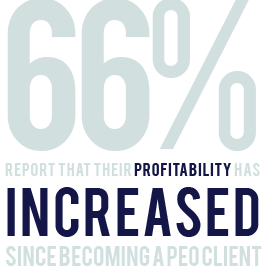 For the individual companies engaging a PEO this dramatically transformed their ability to attract and retain talent. Appointing a Professional Employment Organisation also provided a cost-effective alternative for the management and processing of all the back-office functions surrounding employment. What this simple change can make to an organisation, is extraordinary. Benefiting from a more engaged loyal workforce and no longer being consumed with those time consuming admin processes it gave companies a distinct and very real competitive advantage. Suddenly all internal resource was freed to focus on the company’s core business mission, increasing productivity and driving performance. In 2017, The National Association of Professional Employment Organisations carried out a wide-ranging study to examine the impact PEO can have on the bottom line. 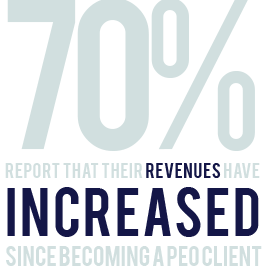 Since adopting PEO, 70% reported that their revenues had increased and 66% had reported that their profits had also increased. 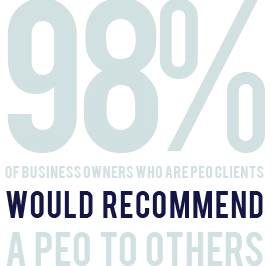 Meanwhile, 98% would recommend PEO. Today, over 150,000 US firms now engage workers through a PEO. Why PEO works for the UK Temporary Recruitment Market? It’s simple. Your contingent workers are employed via your PEO provider. So, they’re on full PAYE, removing all supply chain risk and giving the worker, all the employee benefits they could expect if they were a full-time employee. As the Professional Employment organisations are specialists in payroll, tax and compliance, they take on this critical management of all the admin and process, freeing your internal teams to concentrate purely on fee-generating activity. PEO offers recruiters the chance to attract talent and importantly increase candidate loyalty to increase and secure talent pools, so critical today in an environment where contractors and candidates are in short supply. In the new world of work, old solutions are redundant. The world of work has changed for recruiters, end-hirers and contractors. As documented in our legislative timeline, HM Revenue and Customs (HMRC) spurred on by the mounting pressure from Government, Union and Media, have spotlighted on tax avoidance within the provision of temporary labour market. Now more aggressively than ever HMRC and the government are chasing and legislating against the increased use of ‘creative’ ways to exploit any tax loop holes. The simple fact is that the old solutions don’t work anymore. When it comes to payroll, several options have historically dominated the temporary recruitment sector. Limited Companies (Personal Service Companies), Umbrella solutions and Internal PAYE. Due to the Off Payroll Rules, Limited Companies (PSCs) are already outlawed in the Public Sector for contract workers, we are now counting down until this comes into effect in the Private Sector in April 2020. The only UK alternative to the above options has previously been internal PAYE, yet as experienced by those US companies this quickly transcends into an admin headache and so much hidden costs that it soon mounts in to a resource drain. Recruiters should be recruiting, not sorting out payroll or employment responsibilities for their contingent workers. We make all the usual deductions like national insurance and income tax and charge you nothing. No more complicated payslips where it’s hard to see where the money is going. PAYE is as simple as it gets. HMRCs ban on IR35 travel and subsistence claims in April 2016 was the pivotal point when the Umbrella Companies advantages disappeared overnight for contract workers. No longer offering any ‘tax advantage’ to contractors, it has resulted in what many could view as workers essentially being charged a fee for ‘PAYE’. With the introduction of the Criminal Finances Act, HMRC has brought non-compliance very close to home for all those involved in the temporary workforce supply chain. In-depth compliance monitoring of all Intermediaries and suppliers on a Preferred Supplier Lists (PSL) have escalated due to this ever-changing legislative landscape. Protecting both worker and recruiter, and indeed the individual directors of any business, who could potentially be at risk of facilitating tax-avoidance (knowingly or un-knowingly) has become very real reality. For companies still engaging with suppliers who provide tax-based solutions, the knock-on effects have been an increased demand for resource allocation and costs to monitor and protect potential exposure. What is key for anyone reviewing a PEO is the understand it is not a tax-based solution. Workers are paid solely by PAYE so all Taxes and Deductions are paid in full at source. This provides a future proof solution which removes any concern of immediate or future legislative changes. At People, we’re all about delivering innovative talent solutions that drive business growth. So, when we looked at how to make Payroll better, PEO was the obvious choice. But we wanted to escalate the advantages further by adapting to the modern age of work. Remaining true to the key values and foundations of the Professional Employment Organisation: as a method to attract and retention talent and to increase the productivity and drive growth of the individual company enlisting the PEO. People have adapting PEO for the UK and the new world of work. The Digital Future is progressing upon us, so we put our PEO solution on the most robust technology platform in the UK. By doing this we can continue to develop and roll out a range of productivity apps and tools that turbo boosts the standard benefits of PEO and take it one step further.Recruiters who adopt the People Contractor Workforce management technology into their systems can redefine the traditional methods of on-boarding and placement, revolutionising it from a admin headache into an automated productivity tool. While the contractors app give workers the ability to schedule their time, accept new assignments and automate time-sheets and view payslips and benefits all at a touch of a button At People, we’ve taken PEO and used it to transform payroll into a growth accelerator for businesses. For the contingent workforce and the forward-thinking recruiter, PEO from People is the right choice.